Quick delivery, very well packed. Excellent service as always. 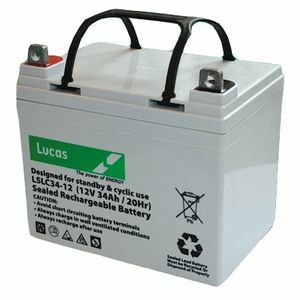 Top quality batteries at a competitive price, quick delivery, very satisfied. Excellent service from Tayna - batteries arrived safely and were fitted to mobility scooter with ease, the carrying handles made the fitting easier. Ordered on a Tuesday, delivered by Friday, came 100% charged, best price around. I use the battery to run a 20lb Trolling Motor and i reckon i would get around 5-6 hours continuous use. Battery function fine ...handles poor when golf trolley charger attachment fitted....the two don't accommodate each other and one plastic handle snapped within 2 weeks Previous battery a accommodated a canvass strap- much better!!! Very good service with a delivery time to suit us. Excellent service, as previously. Many thanks. Next day delivery,best price. I needed a reliable battery for my wheelchair at a good price and these batteries fit the bill. The supply service worked.It was delivered on the date advised. It was the correct product. It looked nice.When fitted it worked .But it has hardly had enough time (three weeks) to assess it's performance capability or durability. If it doesn't last more than 5 years ....expect further contact!!! assuming I live that long! My batteries arrived the next day. My powerchair is now up and running again. The batteries were almost fully charged when they arrived so in a very short time period they were fully charged and good to go. A fantastic service from Tayna. I will recommend both the batteries and seller to my friends. Thank you ??? ?